Everybody is put into a leadership position at some point. This book will teach you valuable principles in leadership and management for bringing about positive change. 207 pages, from Nelson. About "Developing the Leader Within You"
In this bestseller, John Maxwell examines the differences between leadership styles, outlines principles for inspiring, motivating, and influencing others. These principles can be used in any organization to foster integrity and self discipline and bring a positive change. Developing the Leader Within You also allows readers to examine how to be effective in the highest calling of leadership by understanding the five characteristics that set "leader managers" apart from "run-of-the-mill managers". In this Maxwell classic, he shows readers how to develop the vision, value, influence, and motivation required of successful leaders. 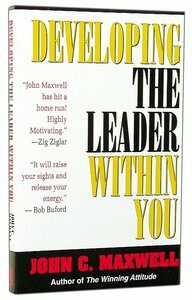 Customer Reviews For "Developing the Leader Within You"